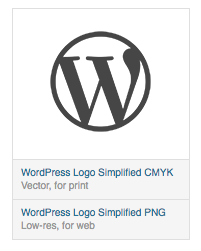 In the transition to the new design, I lost the simplified WordPress logo from the Graphic and Logos page. We need to add it back. It needs to be included on this page: ​https://wordpress.org/about/logos/ and with the same styling as the others. Props to @nickhamze for finding this. @mapk Do you have the assets for this? From what I can tell, the assets which were previously linked differ from what is now linked significantly. @mapk Any chance you could upload the needed assets to this ticket? @obenland, these are the two assets needed as mentioned by @dd32. Oh that was quick! Do you have an image with a gray background too, to go with the other logos on ​https://wordpress.org/about/logos/?